Replace missing teeth in Issaquah, WA. Lending your smile a helping hand. Fixed bridge: With this type of bridge, Dr. Vanama attaches a crown to either end with your new replacement teeth between them. The crowns go on top of your natural teeth to the immediate left and right of where she is replacing your missing teeth. Your new teeth rest securely on your gum line. Dr. Vanama can place a fixed bridge at any location in your mouth. 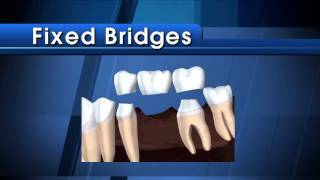 Resin-bonded bridge: Also known as a Maryland bridge, a resin-bonded bridge includes replacement teeth that cover a gap in your mouth. Your dentist in Issaquah attaches metal bands to the neighboring teeth for support. This type of bridge is ideal when you are missing teeth in the front of your mouth because Dr. Vanama can place the metal bands behind the teeth. It’s also a good alternative when your supporting teeth are still strong and don’t need a crown. Cantilever bridge: This type uses only one nearby tooth for support. It is usually the best solution to replace a missing tooth in the back of your mouth or another location when only one tooth is available to provide anchoring support. According to the American Dental Association, two-thirds of adults have lost at least one tooth by the time they are 45 years old. The most common reasons are accidents, tooth decay, and root canals that could not save a tooth. Regardless of the reason for missing teeth, it is important to visit a dentist in Issaquah to replace them as soon as possible. That is because tooth loss presents more than just a cosmetic concern. When you are missing even a single tooth, it causes the remaining teeth to shift towards the open position. This is my third time coming to Discovery Dental and it was another great experience! From the office manager to the hygienist to the dentist, everyone is so warm, gentle, and knowledgeable. I especially love getting to watch a show during the visit! I will definitely be back and would recommend Discovery Dental to anyone looking for a new dentist! Dr. Vanama will consider your preferences, budget, and tooth replacement needs when making a specific recommendation.